It’s time to get moving and grooving! Physical activity can be beneficial for children of all ages but is especially important for young children. Children who start with a healthy lifestyle at a young age will carry the benefits for the rest of their lives. One of the prominent benefits of physical activity in children is the development of motor skills. We as humans’ possess both gross and fine motor skills. Gross motor skills in children allow them to perform everyday activities such as running, walking, and jumping. Fine motor skills involve the uses of the muscles in the hands, fingers, and thumbs that allow children to write, feed oneself, and button a shirt. Having good motor control helps children to begin exploring the world around them and it helps with their cognitive development. As adults’ skills like kicking, throwing, and climbing may seem basic. However, for children, these skills take time and focus to develop. Mastering these skills is a critical part of childhood development, so it is critical to encourage children to practice these skills. Children must learn these skills before they can continue much further. Physical activity is a great and fun way to start teaching your little one these skills. Whether its active games in the backyard or group play in the park, this time can help children focus on things such as kicking, throwing, and climbing. Through play, children can practice these techniques and over time, they become ingrained in their muscle memory. Over time, things such as jumping and running across the grass become easier for a child, since they are developing better balance and can focus on things besides just staying upright. 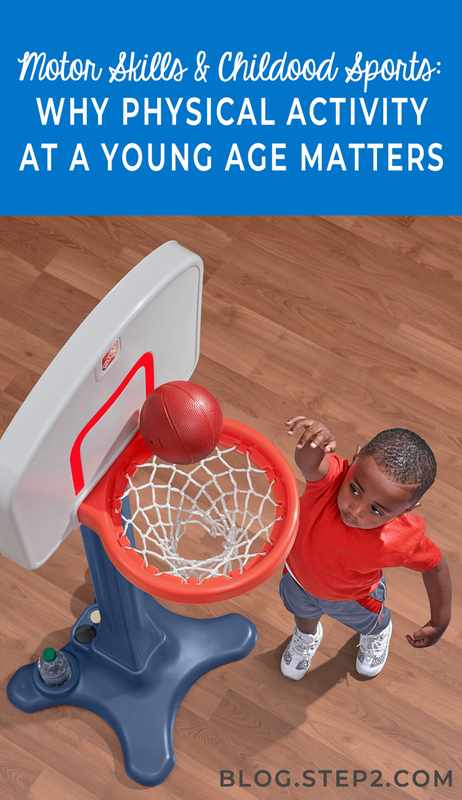 Encouraging your child to play and be active is one of the most important things you can do as a parent. Having dedicated physical activity time together can allow you to develop a better bond and increase motor skills. You can help develop your little one’s motor and coordination skills through hitting a baseball off a tee. As they try to hit the ball, they must learn to focus on connecting the bat with the ball on the tee. Gripping a bat properly helps encourage fine motor skills that your child can use in other areas. Multi-purpose climbers are a great way to start encouraging the development of multiple skills. Not only are they fun, but they allow your little one to try different skills that include kicking, climbing, and throwing. There are a variety of climbers on the market to fit the needs of children of all ages. Step2 has sports climbers for children as young as 12 months, toddlers, and even kindergarteners. What are you waiting for? Now’s the time to start incorporating physical play into your little one’s daily routine. Not only does it give you time together but you will help them lay the foundation for a healthy lifestyle.